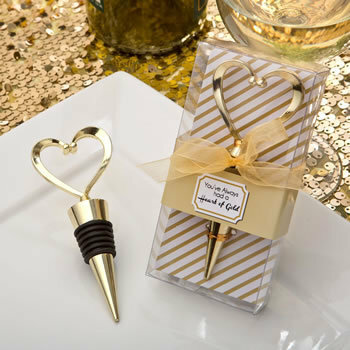 Add a sentimental touch of love to your romantic event with this beautiful heart of gold bottle stopper. This caste metal heart features a luxurious gold plated finish. It has two gold balls on top, symbolizing the love that binds two people. The heart is attached to a gold metal bottle stopper that has a black rubber gasket for a tight seal. The special message reads 'You've always had a heart of gold' and will perfectly showcase the feelings of your romantic occasion, making this a truly special favor for your guests to take home. Size is 4 1/2" x 1 3/4"
A stunning romantic favor in a luxurious gold finish to add that final touch to your special day! Please allow up to 5 business days to fulfill your order; add ship time from NY.